Grupo Sunset World launches a campaign in all its resorts and hotels to eliminate the use of straws in its restaurants and bars. Hacienda Tres Ríos, always at the forefront of sustainability issues, is leading this effort. Employees will be a fundamental part of the campaign, as their task will be to explain to the visitor why we should avoid using straws. Guests of Hacienda Tres Ríos, the luxury and environmentally responsible resort in the Riviera Maya, have recently noticed that their drinks are being served without a straw. Not because they have been forgotten, but because of an awareness campaign launched by Grupo Sunset World in all its properties. The purpose is to eradicate the use of this disposable object and avoid polluting in our seas and natural areas with more plastic. "Straws are used for few minutes and take 200 years to disintegrate. That's why we must avoid using them. Do you really need one? Ask for the biodegradable option, " explain the leaders of this initiative, who are training the employees, who in turn, transmit the message to members and guests of the resort. If the guest wishes to use a straw, the biodegradable alternative is offered: corn-based straws, which do not take a long time to disintegrate. This initiative is part of the growing international movement to avoid the use of plastics, since more than ten million tons of plastic trash are thrown into the oceans each year. It is predicted that by 2050, there would be more plastic than fish in the sea. We have time to reverse this alarming trend and join the Secretaría De Medio Ambiente y Recursos Naturales (Ministry of Environment and Natural Resources) proposal, #SinPopote (without a straw) is fine. 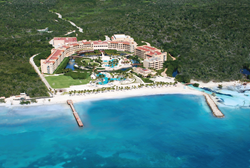 The campaign has already been implemented in the six properties that make up Grupo Sunset World with the cooperation of employees, members and guests in Cancún and the Riviera Maya. In Hacienda Tres Ríos alone, approximately 6,000 conventional straws were used each month, and now less than 1,500 biodegradable straws are used in the same period. It is important to note that these straws degrade in a maximum of 6 months and are made from corn starch and are completely organic. "We are proud to be part of this international movement to reduce our dependence on disposable plastic. Any action, big or small, can make a big difference,” said Annie Arroyo, Brand and Communications Director of Grupo Sunset World. Hacienda Tres Ríos has always distinguished itself with initiatives that contribute to better coexistence with the environment and benefit the local economy. For example, all personal and skin care products offered as amenities in the resort's rooms are made from honey that comes from Ethos farm, which supplies the entire Grupo Sunset World chain. Ethos also produces fruits, vegetables, flowers and eggs produced in a natural environment, free of chemicals and using techniques of Mayan origin. Hacienda Tres Ríos, the flagship resort of Grupo Sunset World, follows environmental criteria that guided its design, engineering and construction. The first floor of the resort was built three meters above sea level on stilts, allowing water to flow freely under the buildings, protecting the mangroves that live there. In addition, drainage pipes were placed under the roads every 50 meters allowing the water with nutrients to flow freely and allow the animals to move from ecosystem to ecosystem. The vision of Orlando Arroyo Marroquín, CEO of Grupo Sunset World and architect of the Tres Ríos project, was to create a luxurious, comfortable, ecologically sustainable space. Firmly anchored in responsible business ethics, engineer Orlando Arroyo has promoted best practices in Hacienda Tres Ríos, and the happy consequence has been saving money and preserving the environment. Currently everything in the resort - lighting, heating and cooling - operates with high efficiency. Water comes from daily rain collection and an effective desalination and purification plant, so as not to use water from the public water system. The resort has received many awards in its first ten years with this concept that continues to implement initiatives to protect the planet.